…that my paths are messed up again. 😛 Since patterns get in the way of acorns anyway, I’m going to wait until the Acorn Festival is done with before I change them again. And Peewee’s moved out, the last of my original eight neighbors other than Puddles. It was so weird seeing his spot vacant. 😦 Fortunately it’s already filled again! Other than all three beach house locations, this one is my favorite. I spent a while Saturday preparing for the Acorn Festival by removing flowers in front of oak trees. 😦 It was painful to do, but I want my mush furniture! I tried to put the displaced flowers elsewhere in town, but there was really no room, so I ended up saving a lot in letters at the town hall. I can’t wait to get everything back to normal and to do some re-decorating with my paths. Yay 😀 Time to hunt for acorns! Even though I hated doing it, picking up flowers did help improve my acorn count. I wouldn’t have gotten any of these here if I had left the flowers. It could’ve been better because I missed quite a few as a result of my path patterns, but I managed to find 28 non-rotten acorns and took them to Tor — I mean, Cornimer. For the 28 I found yesterday and the 37 I found today (good improvement! ), I received the mushroom stool, end table, lamp, chair, and dresser. Hope I’m on the right track so far to getting them all! Tipper’s unpacked now, so I checked out her interior decorating. The gyroids make mooing sounds. Random pictures of Puddles being cute 😛 She says this a lot. 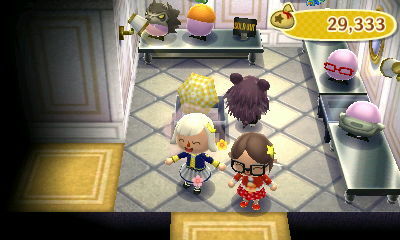 Posted on October 4, 2011 by Amy •	This entry was posted in AC:WW, Dafdilly and tagged Animal Crossing. Bookmark the permalink. I like your living room 🙂 It’s like any other living room,right? Maybe it’s because you didn’t follow some Feng Shui style? Yep, sorry about that. 😛 I enjoyed the paths while they lasted! The good thing about your hedges is that they will last until winter when the ground changes. 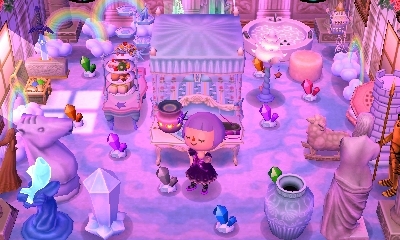 I know, I would love the sweets theme in my living room! Since it’s not in AC:WW, I went with a cabin feel like Melba’s house, my favorite neighbor. Getting City Folk has crossed my mind recently, we’ll see! 😛 It would be cool to try it out and blog about it for a bit, but AC:WW will probably remain my main game and my favorite unless AC:3DS surpasses it. 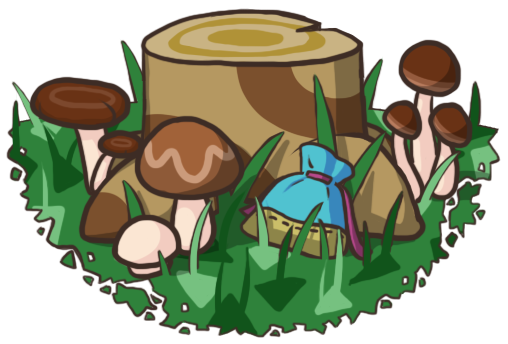 Since you already have all the mush furniture in one of your rooms, there’s no pressure to max out your number of acorns or even obtain any of the mush furniture, so that’s nice! Are you going to sell the extras or put them in storage? Well, I have a full set of mush furniture from my previous town saved in Red Bank, but since I’m going to use the mush furniture for Twisk’s room, I thought Twisk should earn all the furniture again herself. 😛 I might use some of the extra pieces in my dad’s town for her room, though. Yeah, a lot of the trees I planted with money produce acorns (I guess they're just like regular saplings if they don't grow into a money tree), but not my money tree. Unlike Dafdilly, some of these similar towns have a house location on that tiny island, which I don’t really like. Yeah, I was one of those people once. 😛 I resetted until I got my house on an island, but ended up not liking it because the island was the biggest part of town (I would rather it be a small feature) and there were only 2 bridges, making it hard to navigate. I saw that email before, but I had no idea how I was going to see the picture. I kept clicking and nothing was happening! 😆 Not used to yahoo, my main email is gmail… Well I’ve downloaded the attachment now and the pattern looks intriguing, I can’t wait to see what it looks like on palette 12! 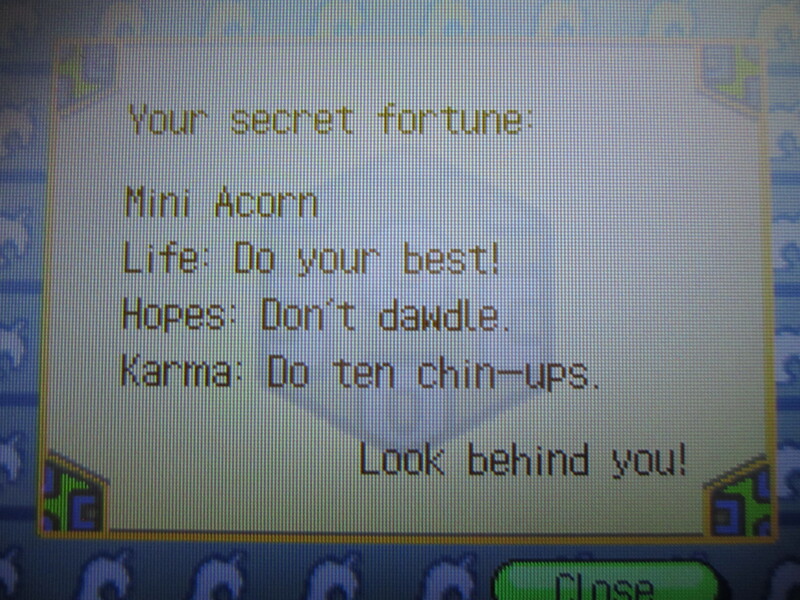 I only have one money tree, the 30,000 bells I planted didn’t grow into one. 😦 They seem really hard to grow; out of all the 1,000 bells I planted the day I re-planted my trees, only one grew. I’ve heard that feng shui (especially the yellow side, which has to do with money) increases the chances of trees planted with money to grow into money trees. Yeah, Puddles says both of the things I posted a lot (the Puddles sisters thing and asking which color suits her best) because they’re things she says when she runs up to you to start a conversation after 15 minutes of not talking to her, and I’m always busy watering flowers, or in this case, picking up flowers and patterns and collecting acorns. I’m not gonna throw a party or anything but i just wanna wi-fi at that time! I guess i just can't wait to see the snow again! I might have a few pitfalls, but it doesn’t look like I have many at all unless I put them in a dresser and forgot about them. Usually Booker has a lot but he only has one right now for some reason. Yeah, if 8 AM is okay for you and not too early, that works for me. I can also WiFi later, you know how I often stay up late. xP My town is still under construction in terms of patterns, but I’ll at least try to clean up. K.K. Ragtime reminds me of Melba! 😀 She had it in her house and I thought it was so fitting. I don’t know what the deal is with snowballs and WiFi, it’s so weird that we couldn’t find any in Nimrodel… 😕 I’ve seen snowmen during WiFi, so you’d think snowballs would still be there, but I guess not. btw do you believe that Cornimer is Tortimer dressed up? Or, some related someone? I know, it’s been too long since my last update! >_< The reasons for not posting were just one thing after another, but I definitely will this weekend. I believe that too! And, nope, Tortimer doesn’t appear in the Town Hall during the Acorn Festival! I did a pool about this question as I think it’s pretty interesting, as it isn’t assured by Nintendo and there are just rumors about it. I caught a mole cricket, I just realized… If i started on April. I put the fountain near the Main Gate, so it gives me a City Folk feel. Thanks! I’ve done a draft of it on the computer and I’m going to finish it in the game. I haven’t even started on the well (maybe you saw my latest forum post on ACC and that’s how you knew I was planning on making one?) because it’s not high on my priorities. I need to make new borders for my main path and patterns to go on my fall garden for your contest first. Nice fountain! Mine isn’t multi-layered like yours or Katrina’s (which it looks like you based yours on), there’s just one collecting pool at the bottom with lots of water spouting out. I’ll put the benches there and some picnic areas!